18th October: Meet at Bedfont Football Club and run all or part of new 5-mile course and check out feasibility of using (i) the Green Man and (ii) the Bell on the Green as start and finish point. 25th October: 5 mile run - staggered "handicap" start. Start/Finish to be advised in next Monday's digest. 1st November: Cranford Community College - car park, changing rooms, run the streets of Cranford and Heston, showers, committee meeting - all welcome. 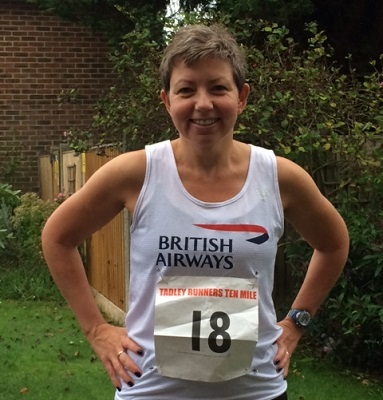 BA has a new Lady in the XC team, Jan Jones who works in T5. Thanks to Julie Barclay for introducing her sister to BAAC. Tom had kindly collected our numbers and Julie, who had run in Div 1 at 1100, was with Tom waiting for her sister to arrive. Who should her sister be, but the lady I had spoken to in the carpark. Unbeknown to each other we had first met by chance when Jan was driving around the carpark looking for a spot as I was walking out towards the race area. Conditions were good for the start of the XC season, it was a mild Autumn day, the sun trying to break through, little mud, but lots of hills and plenty of competitors despite Div 1 & Div 2 running separately for the first time. It was a well marked and marshalled course and a well organised event. I met Jackie Musselwhite, another Woking AC member, who I had seen the previous week in SIN for WARR. She confirmed that the hills were tough, but she looked happy having finished her run in Div 1. Tom, Julie, Paul Watt, Jackie Musselwhite, Peter Collins of Runnymede and Natalie Ruffell, who also ran in Div1, but had stayed on. I also met up with Janet Cunningham of Epsom Allsorts another Div 2 club. 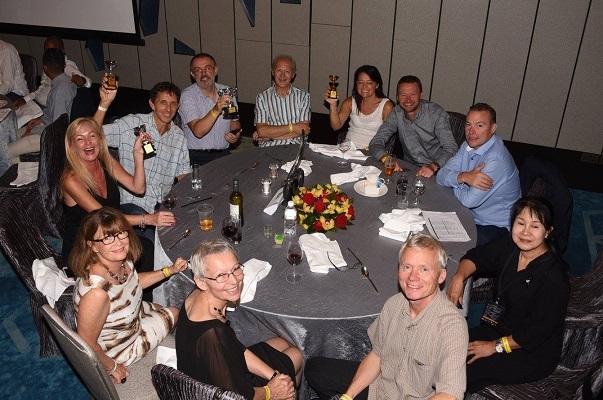 So it turned out to be quite a social event despite having only 2 BAAC ladies present. Janice finished in 38.24 and Helen 43.41. Additional report - see "Tom's Diary" below. This was an interesting first race of the season to the say the least. With over 300 runners the organisers wanted to try and avoid bottle-necks around the narrow wooded course, so we started at the bottom of a hill. Despite best intentions, the bottlenecks weren't avoided and the start / first 1km were akin to the start of a large marathon with lots of stopping and starting! Add to this a few well-placed low hanging branches (which caught at least one runner on the head causing a bad gash) and you had one of the oddest XCs I think I've done. The hill was energy sapping and having to climb it three times in muggy conditions didn't help but we got our team of 10 home in one piece. Good to see a few returning from injury. We placed 10th of 12 teams, less than 20 points behind 9th place Barnes Runners. We gathered at a darkened Uxbridge track on Monday evening. Once the floodlights had been cranked up, three of us set out to test Usain’s world record. The lane draw was made, the crowd was silenced and the musketeers leapt into action on the B of the Bang. Luckily for Mr Bolt, conditions were not quite perfect, and his record lives on for another day. Simon broke the tape first, with Steve and Tony attempting to chase him down. We then went on to complete a “pyramid”: Intervals of 300m, 400m, 500m, 400m, 300m & 200m, with 100m walks in between. A challenging but enjoyable session. The final GP of 2017 will be the 100m. Let us know if you want to join in the fun. These are the provisional results. It wouldn't be WARR without there being something wrong in what has been produced and the known error at the moment (but the only known error) is in Jude's result where the chips in his bib and that of another runner have been interchanged - so the chip in bib "997" was that of runner "986" and v.v. . Above is shown what we believe Jude ran and finished. In the WARR published result he is given a time in the 5k instead - impossible since he was 5k away at that time, running the parkrun. In the scheme of things this doesn't make much difference to us, Jude wouldn't have got a prize in the 10k nor were BA near a team prize. However the other half of this mix up means that an American Airline's lady competitor was incorrectly announced as 3rd overall in the 10k and the knock-on effect of that will impact the age grade results, and potentially the team results as well. We are best well out of it! But we have reported the error and it is being investigated. Several of our runners prioritised the opening round of the cross country league fixtures (results reported elsewhere) this weekend although Paul Knechtl (45:45 at Bushy) and Chris Kelly (21:32 at Reading) put in a loosening up parkrun in the morning. Several other runners from the club who were at WARR in Singapore last week have carried on to Australia with longer runs in Melbourne perhaps the main target. Benita (31:16) and John Scaife (31:17) dropped in to Darwin and became our first members to do a parkrun in the Northern Territory. Piers Keenleyside (25:39) chose Willoughby in Sydney while Roderick Hoffman (27:53) was the furthest south at Lillydale Lake in Melbourne. He was accompanied there by his sister Charlotte Habgood (36:30). 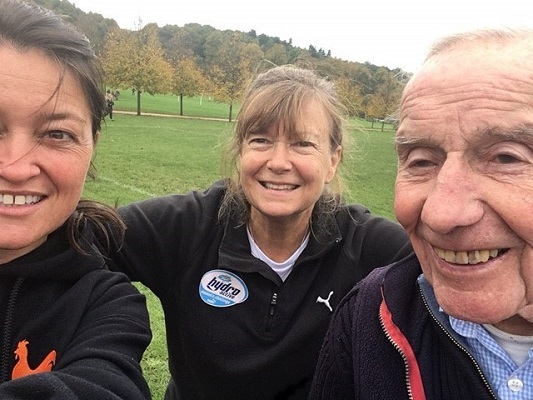 A common sibling, Sarah Gordon, put on a volunteer turn at Stratford-on-Avon where most of the volunteer roles were taken up by seasoned parkrun tourists. Back in Australia and former member Caroline Yarnell (23:38), now a member of Sydney Striders, put in one of her occasional appearances at her adopted home run at Curl Curl in Sydney. Joe Nolan (29:40) made his first visit to Homewood which was celebrating its first anniversary. The run attracted a small field of 77 runners so for tourists who feel crowded out at some of the busier runs the new course at Ottershaw may be one to consider although be warned it is very much off road and needs a robust approach! Steve Newell (35:53) ventured outside the M25 and went to Heartwood Forest (just beyond St Albans) for the first time. It is a really pleasant venue with a bit of climbing to do early on and at midway but featuring a delightful glide down to the finish. The recommended parking spot is the Sandridge Village Hall with toilets about half a mile from the finish line/rendezvous point. The nearest rail station is Cheam with a suitable train leaving London Victoria at 0801 and calling at Clapham Junction at 0808. There is plenty of parking as you see at http://www.parkrun.org.uk/nonsuch/course/ but the car parks do get busy so don’t leave it too late. All are about 5 minutes from the start near the Mansion House. Anyone familiar with the cross country starts will know where to go. I appear to hold the club record so anyone attempting to run faster than 21 minutes is likely to get tripped up! Coffee and cake at the Mansion House café afterwards. If there are any questions do ask me. Everyone is welcome even if you've never done a parkrun before - visit www.parkrun.org.uk to register and print off your personal barcode, needed to record your result. Spectators also welcome and if you ask nicely the organising team will give you a volunteer role. Good to see Joe Nolan out on the course supporting. I haven't run a 10 mile race for a long time and was keen to do the Cabbage Patch 10 as I grew up in Twickenham and worked at the Cabbage Patch pub for 5 years. However, at £27, I looked for a cheaper race and found the Tadley Reverse 10 at £16. It gets it's name from the fact that they change the direction of the race each year. At the race HQ parking was plentiful and easy, with loud motivational music playing. The weather was great for running, cool with a light breeze. I started off ok but after about 6 miles began to struggle a bit until the end. My finish time was 1:38:42 so just under 10 minute miles. It was a lovely route, all on quiet countryside lanes, not hilly, just a bit undulating in places. The finish was well organised, with a goody bag containing water, a banana and a glass laser etched memento for everyone. I would definitely do this race again but would aim to get the start line in a fitter condition! Very good running conditions - cool and only a light breeze. Crowded start, and even half way through the half marathon I was having to be careful to avoid other runners. For the second week running I ran on a F1 Grand Prix circuit - last week Singapore, this week Melbourne (also known as the Albert Park parkrun circuit). I was amused that Piers' race was sponsored by a medical health company, mine by a OneWorld Airline (SriLankan) and my sister's by a Coffee Cafe chain. This was Pier's 20th marathon of this year and he has four more scheduled (and might fit in a 25th as well). Overall he has run 140 Marathons. We may think that Piers, and the other ultra-runners in the club, are out of their mind but in the restaurant this evening he was telling me of someone who has run 800 marathons, and in an average time of under 3:15. So, out of this world as well as out of their mind. A year on from WARR in Chicago it was time for a return visit to check off my third major. The race had an early start at 7:30 which was really helpful as it was a hot day. I managed my usual metronomic pacing and negative split to finish in 3:39:50. Beforehand my target had been to achieve a Boston qualifying time of 3:40 so very much job done even if I did need to run the last 2k somewhat faster than I would have liked. Sat. 14th Oct. was a long tough day that started at 7.45 having been offered a lift by Paul/Julie we headed to the Banstead parkrun. Paul not having run for 4/5 days owing to a problem with his heel decided to give it a testing over this course. While Julie and myself sat on a bench seat after climbing a mountain and give Paul lots of encouragement as he passed by twice, and running comfortable and relaxed as he passed us and finished in 23rd spot in 22.36. Paul‘s second lap time was 12.31 so came through ok and he'll see how the heel feels on Sun. Then off again for the short journey to Reigate, arrived at 10.00 (no parking problem). As arranged I picked up the BA numbers and things have changed since my days as team manager - i just gave out the numbers, no declaration of teams to do - its all HI-TEC. In the first race Julie Barclay ran for Woking over this very tough XC course just as a gale force wind started. She ran sensibly in the middle of pack to finish 126th out of the 243 in 30.38. Also running for Woking was Jacqui Musselwhite after her WARR experience with brother Adrian Haines. Jacqui finished 171st in 32.32. Then the BA team arrived sadly we only had Janice Jones and Helen Smith who than met up with Jacqui for a chat so a friendly reunion. First we had a team photo before they started. I gave a very quick team talk “just win” but they both forgot. We headed into the woods to see them 2/3 times, both came by smiling and running at a pace they could manage. Took snaps of them in action, Janice leading the team over both laps to finish 174th in 38.24 and Helen was 206th in 43.41. With five to score the team was penalised by runners 3, 4 and 5 being given the maximum 228 points. Not end of story as running for Linfield was Julie’s other sister Vera who was 172nd in 38.01 just in front of Janice. And their mum Vera was watching from the side lines stopping them from fighting. I handed all the team numbers over to Helen to pass on to Clara. One thing was missing today - NO BREAD PUDDING. Pictured - Jacqui, Helen and Tom.